Sharing the same bearing mechanism as the Revolver Bar Stool, which enables the seat to rotate 360 degrees, Leon Ransmeier’s Revolver Stool offers a versatile and functional design. The slim, slightly dished seat with curved edges is offset by straight, angled legs, creating an uncluttered silhouette that offers limitless applications. Made in powder coated steel with a choice of colours, this lower version is suitable for a wide range of public and residential environments. Leon Ransmeier is an American industrial designer who founded the design practise Ransmeier Inc., in New York in 2010. A graduate of the Rhode Island School of Design, his work has been included in the permanent collection of the San Fransisco Museum of Modern Art (SFMOMA) and the Corning Museum of Glass. Very much a hands-on designer, Ransmeier develops full size prototypes of all of his works and is a believer in the idea that “use follows form”. 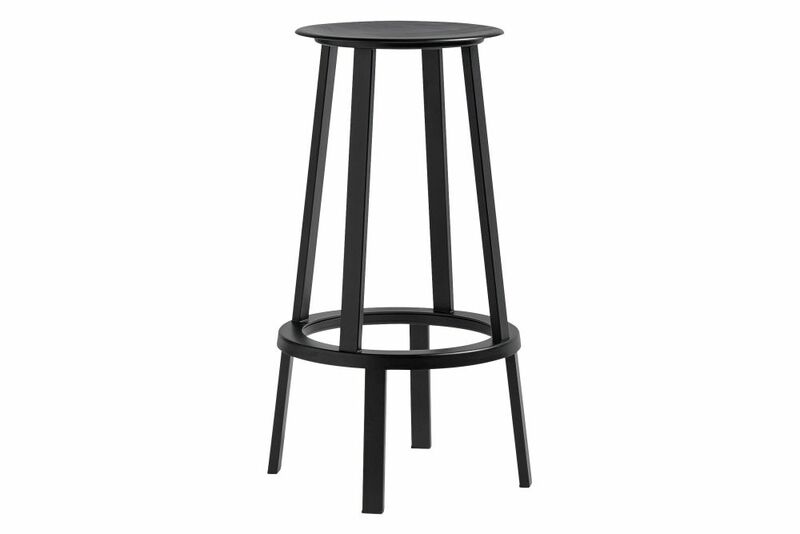 For HAY, Ransmeier has designed the Revolver Stool.